Fish tacos. I have a weak spot when it comes to fish tacos. They are easy to get here in Southern California, but. Oh but. My family and I are about to complete three adventurous years in Los Angeles and when we write 2012, it won’t be so easy to find a good fish taco in our part of Copenhagen. As in Copenhagen, Denmark. Scandinavia. Northern Europe. Cold right now. But Copenhagen is also a great city, so it’s alright. Except that it’s always so sad to say good bye to good friends and to a city like no other in the world, which now and forever will have a special place in my heart!!! 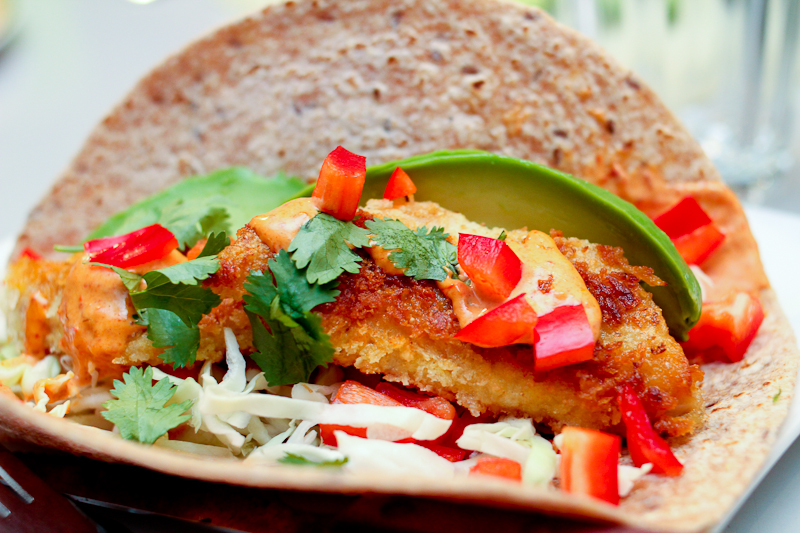 So, here is a fish taco recipe, that I will be making often in the new year. I only hope I can find chipotle chili in adobo sauce?! Wash and dry the fish. Cut into pieces. Grab three deep dishes. Put flour and some salt in one, whish the egg in another and add the breadcrumbs to the third dish. Take a large skillet and warm the oil. Prepare one piece of fish at a time, dip it in the flour first, then the egg and last in the bread crumbs. Fry until golden. It’s flaky when done. It will only take a few minutes on each side over medium heat. Throw out any leftover flour or bread crumbs! This is real simple. Make as much as you want. Use 2 parts mayonnaise and 1 part chipotle chili in adobo sauce and blend until smooth or simply chop, then stir. If you like it stronger, then use more chili. Done. Serve with your favorite fixings like shredded cabbage, bell pebers, tomatoes, avocado, cucumber etc. and don’t forget a good squeeze of lime juice and fresh cilantro. I served this corn salad with added black beans as a side. Buen provecho! This entry was posted in Dinners in 30 min or less, From the sea, Latin flavors and tagged chipotle sauce recipe, fish tacos, fish tacos with chipotle, mexikanske fisketaco. Bookmark the permalink. Stine, if the post office will allow for me to ship any of these ingredients I most definitely will. Anything for my dear friend to have from LA to enjoy…. Uh lækkert! Det må jeg prøve en dag. Super! Meget trygt at vide, at chipotle kan skaffes i det danske og saa maa jeg da ogsaa lige eksperimenter lidt med tomatsuppe.Tak, Martin!